Preheat the oven to 375ºF. Spray the baking dish with a nonstick cooking spray. 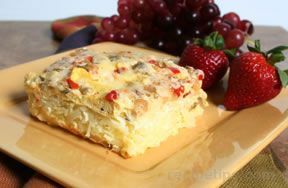 In a bowl, stir 2 eggs or 4 ounces of egg substitute with the hash browns and 1/2 cup shredded cheese until combined. Place the mixture in the prepared baking dish. Divide the ricotta cheese evenly over the top of the potato mixture; set aside. In a bowl, add the remaining eggs, 1/4 cup half-n-half, salt, and pepper. Whisk together until combined. In a 10" skillet, melt 1 tablespoon of butter over medium-low heat and pour in the egg mixture; do not stir. Tilt the pan and lightly lift edges of cooked eggs, allowing uncooked egg to fall to the bottom of the pan. Cook only 3 to 4 minutes or until eggs are slightly cooked and remain shiny on top. Slide the eggs onto potato mixture in the baking dish. In the skillet, sauté red pepper and onion; remove from the skillet and set aside. 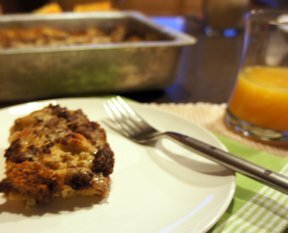 In the same skillet, melt 2 tablespoons of butter, whisk in 2 tablespoons of flour, and gradually add 1/2 cup half-n-half, stirring until thickened. Add the sautéed vegetables back into the skillet; then add the diced green chili peppers and the remaining cheese and cook one additional minute. 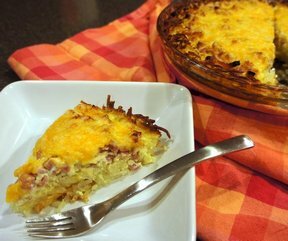 Spread evenly over the potato and egg layers in the baking dish. Bake 25 minutes, uncovered, at 375ºF. TIP: To save time, mix the potatoes and place in the prepared pan the night before. Measure out the egg mixture, season, and place in a separate container. Sauté the vegetables, combine with the green chilies, and place in a separate container. Store everything in the refrigerator until ready to assemble the next day. OPTIONAL: This recipe may be too bland for some, so to provide a spicier flavor, consider adding any of the following to taste: sharp cheese, pepper flavored cheese, or hotter chili peppers. "good but a lot of prep time (a lot of steps). also I believe the amount of flour listed in the ingredients is incorrect, it should be 2T. I also feel like some other measurements may be wrong, but not sure. still turned out good."